Abstract: Brazil has an aging population, with an associated increase in the prevalence of chronic diseases. Postmenopausal osteoporosis is of particular concern because it leads to an increased risk of fractures, with subsequent negative impacts on health in older women. In recent years, efforts have been made to better understand the epidemiology of osteoporosis in Brazil, and to manage both direct and indirect costs to the Brazilian health care system. The reported prevalence of osteoporosis among postmenopausal women in Brazil varies from 15% to 33%, depending on the study methodology and the use of bone densitometry data or self-reporting by participants. A diagnosis of osteoporosis can be made on the basis of fractures occurring without significant trauma or on the basis of low bone mineral density measured by dual energy X-ray absorptiometry. To reduce the risk of osteoporosis, all postmenopausal women should be encouraged to maintain a healthy lifestyle, which includes physical activity and a balanced diet. Smoking and alcohol use should also be addressed. Special attention should be given to interventions to reduce the risk of falls, especially among older women. Calcium intake should be encouraged, preferably through diet. The decision to recommend calcium supplementation should be made individually because there is concern about a possible increased risk of cardiovascular disease associated with this treatment. Brazilian women obtain a minimal amount of vitamin D from their diet, and supplementation is warranted in women with little exposure to solar ultraviolet-B radiation. For women diagnosed with osteoporosis, some form of pharmacologic therapy should be initiated. Compliance with treatment should be monitored, and the treatment period should be individualized for each patient. The Brazilian government provides medication for osteoporosis through the public health system free of charge, but without proper epidemiological knowledge, the implementation of public health programs is impaired. The Brazilian population has aged considerably over the past few decades. Data from the population census indicate an inversion of the national age pyramid. It is estimated that by the year 2050, the elderly will account for 23% of the population, and children aged 0–14 years will account for only 13% of the population.1 As a population ages, the epidemiology of disease changes. In the past, acute infectious diseases accounted for the vast majority of health problems. Currently, chronic diseases have an increasingly important impact on the lives of the Brazilian people.2 Therefore, physicians should keep up to date with the management of the chronic diseases that are common in an aging population. Among these chronic diseases, postmenopausal osteoporosis is of particular importance because of its potentially harmful consequences to health in elderly women and the fact that relatively simple treatments can change the natural history of the disease. Osteoporosis is a chronic disease, defined as a skeletal disorder characterized by decreased bone strength, which predisposes affected individuals to fractures.3 A diagnosis of osteoporosis can be made on the based of either fractures occurring without significant trauma or low bone mineral density measured by dual energy X-ray absorptiometry (DXA).4 Most women with osteoporosis are asymptomatic, which makes epidemiological research especially difficult. In Brazil, a large country with extremely diverse characteristics from region to region, accurately determining the prevalence of osteoporosis is a complicated task. In recent years, efforts have been made to better understand the epidemiology of postmenopausal osteoporosis and to manage both the direct and the indirect costs of the disease to the Brazilian health care system.5 In this article, we review recent studies of the epidemiology and management of postmenopausal osteoporosis, with a particular focus on the situation in Brazil. The reported prevalence of postmenopausal osteoporosis in Brazil is highly variable because of differences in the study methodology, the selection of study participants, and the definition of the disease. In a study by Camargo et al6 published in 2005, which included 207 women aged >70 years, osteoporosis was diagnosed by bone densitometry and classified according to World Health Organization (WHO) criteria. The prevalence of osteoporosis ranged from 22.2% to 33.2%, depending on the bone evaluated.6 A study by Martini et al7 published in 2009, used data from a telephone survey on chronic diseases (Vigilância de fatores de risco e proteção para doenças crônicas por inquérito telefônico [Protective and Risk Factors for Chronic Diseases by Telephone Survey]). Interviews were conducted with 54,369 individuals aged ≥18 years, and the presence of osteoporosis was determined on the basis of self-reporting by participants. The prevalence of osteoporosis was 8% in women aged 45–54 years, 19.2% in women aged 55–64 years, and 32.7% in women >65 years.7 In 2010, Pinheiro et al8 published the results of a household survey, the Brazilian Osteoporosis Study (BRAZOS), which included a representative sample of women from all regions of Brazil. Again, the diagnosis of osteoporosis was based on self-reporting by participants. In this survey, 1,695 women aged >40 years were interviewed, and of these approximately 35% were premenopausal. For postmenopausal women, the average age of the last menstrual period was 47±5.1 years. The prevalence of osteoporosis was reported as 15.1%.8 In 2010, Pinheiro et al9 also conducted a cross-sectional study that included 4,332 women aged >40 years in São Paulo (São Paulo Osteoporosis Study [SAPOS]). The diagnosis of osteoporosis was made by DXA, and the prevalence of postmenopausal osteoporosis was 33%.9 In 2011, Buttros et al10 reported a prevalence of 24.6% from a cross-sectional study of 431 women aged 40–75 years with osteoporosis diagnosed by DXA. More recently, in 2013, Baccaro et al11 published the results of a population-based household survey that included 622 women aged >50 years. The prevalence of osteoporosis based on self-reporting was 21.3%, but only 16.7% of the participants reported that the diagnosis of osteoporosis had been made by bone densitometry. As demonstrated by these studies, the prevalence of osteoporosis in Brazil varies widely according to the study methodology. Some studies based the diagnosis of osteoporosis on bone densitometry data and others relied on self-reporting by participants. Furthermore, there are few studies that include a representative sample of the population from all regions of the country. Overall, depending on age and the characteristics of the study population, the reported prevalence of osteoporosis in Brazilian women varies from 15% to 33%. A recent study on the epidemiology of osteoporosis in the United States found a prevalence of 15.4% among women older than 50 years and a prevalence of 34.9% among women older than 80 years.12 Therefore, despite the limitations related to a lack of uniformity of national studies, the percentage of Brazilian women living with osteoporosis appears to be similar to that in other populations. In 2002, the Brazilian Ministry of Health issued a decree to gain a better understanding of the national availability of diagnostic imaging equipment, including bone densitometers.24 According to this decree, 7.1 densitometers per 1 million inhabitants should be available for the population. However, according to a study conducted by the Brazilian Institute of Geography and Statistics (IBGE) in 2009,25 there are 5.6 densitometers per 1 million inhabitants, taking into account both public and private sectors. In the public sector, there are only 1.5 densitometers per 1 million inhabitants. In 2012, Hernandez et al26 published the results of a prospective study of 2,143 people aged ≥60 years living in São Paulo. Among women who had private health insurance (51.3% of the study population), 65.7% reported having osteoporosis. Among women who relied primarily on the public health system, 34.3% reported having osteoporosis.26 These data suggest that women with private health insurance have greater availability of resources for the diagnosis of osteoporosis. However, women who are dependent on the public health system do not have sufficient access to densitometers, which can lead to delayed or missed diagnosis of osteoporosis. Adequate calcium intake should be encouraged in postmenopausal women, preferably through diet. Because calcium supplementation has a beneficial effect on bone mineral density, mineral supplements can be used in patients who do not have adequate nutrition. Calcium supplementation may also reduce the incidence of vertebral fractures, but its effects on the incidence of nonvertebral fractures remains uncertain.30 Recently, there has been concern about a possible increased risk of cardiovascular disease related to the use of calcium supplements. In 2010, Bolland et al31 published a meta-analysis that identified a 31% increase in the risk of myocardial infarction among patients receiving calcium supplementation (≥500 mg/d).31 However, another systematic review and meta-analysis found no association between calcium supplementation and an increased risk of cardiovascular disease.32 Results from the Nurses’ Health Study,33 a large prospective cohort study of 74,245 women followed for 24 years, found no association between the use of calcium supplements and an increased risk of cardiovascular disease. In fact, women who used calcium supplements had a lower incidence of ischemic heart disease.33 Therefore, the decision to recommend calcium supplementation should be made individually, taking into account individual dietary habits. For women diagnosed with osteoporosis, some form of pharmacologic therapy should be initiated. For those with densitometry values compatible with osteopenia, individual risk factors for fracture should be considered to guide treatment decisions. The Fracture Risk Assessment Tool (FRAX) developed by the WHO is now available for use in the Brazilian population,36 although there is no national consensus on the risk thresholds that should indicate initiation of drug therapy. A previous study showed that the association between age and densitometry values is as effective as the FRAX model to identify individuals at high risk of bone fracture.37 New studies on the use of the FRAX tool are needed before it can be used to guide decisions on whether or not to initiate drug therapy for Brazilian women. Drugs with different mechanisms of action are available to treat postmenopausal osteoporosis. Among them are the bisphosphonates, hormone replacement therapy with estrogen, selective estrogen receptor modulators, calcitonin, strontium ranelate, denosumab, and teriparatide. The main characteristics of these drugs are described in Table 2. Figure 1 Flow chart with the medications available free of charge through SUS. Note: *Women with an intact uterus should make use of an estrogen and progesterone association. Abbreviation: SUS, Sistema Único de Saúde. Postmenopausal osteoporosis is a chronic and often asymptomatic disease. The prevalence in Brazil does not differ from that in other countries, but there is limited knowledge about the epidemiology of the disease. More population-based studies with rigorous methodology are necessary, preferably using bone densitometry to classify osteoporosis and with representative sample populations from all regions of the country. The Brazilian government provides medication for osteoporosis through the public health system free of charge, but without proper epidemiological knowledge, the implementation of public health programs is impaired. In addition, conscientization programs for health professionals about the importance of osteoporosis would also be beneficial. If not diagnosed and treated properly, postmenopausal osteoporosis can result in bone fractures, which have negative impacts for both the patient and the health care system. Efforts are needed to ensure that all women in Brazil have access to information on osteoporosis and the opportunity to receive diagnosis and treatment for the disease. This research was carried out without any external funding. Instituto Brasileiro de Geografia e Estatística. Notícias: Em 2008, esperança de vida dos brasileiros chega a 72,86 anos. Comunicação Social, 01 de dezembro de 2009. Available from: http://saladeimprensa.ibge.gov.br/noticias?view=noticia&id=1&idnoticia=1507&busca=1&t=2008-esperanca-vida-brasileiros-chega-72-86-anos. Accessed November 25, 2014. Schmidt MI, Duncan BB, Azevedo e Silva G, et al. Chronic non-communicable diseases in Brazil: burden and current challenges. Lancet. 2011(4);377(9781):1949–1961. NIH Consensus Development Panel on Osteoporosis Prevention, Diagnosis and Therapy. Osteoporosis prevention, diagnosis and therapy. JAMA. 2001;285(6):785–795. Kanis JA. Assessment of fracture risk and its application to screening for postmenopausal osteoporosis: synopsis of a WHO report. WHO Study Group. Osteoporos Int. 1994;4:368–381. Marinho BC, Guerra LP, Drummond JB, Silva BC, Soares MM. The burden of osteoporosis in Brazil. Arq Bras Endocrinol Metabol. 2014;58(5):434–443. Camargo MB, Cendoroglo MS, Ramos LR, et al. Bone mineral density and osteoporosis among a predominantly Caucasian elderly population in the city of São Paulo, Brazil. Osteoporos Int. 2005;16(11):1451–1460. Martini LA, Moura EC, Santos LC, Malta DC, Pinheiro Mde M. Prevalence of self-reported diagnosis of osteoporosis in Brazil, 2006. Rev Saude Publica. 2009;43(2):107–116. Pinheiro MM, Ciconelli RM, Jacques Nde O, Genaro PS, Martini LA, Ferraz MB. 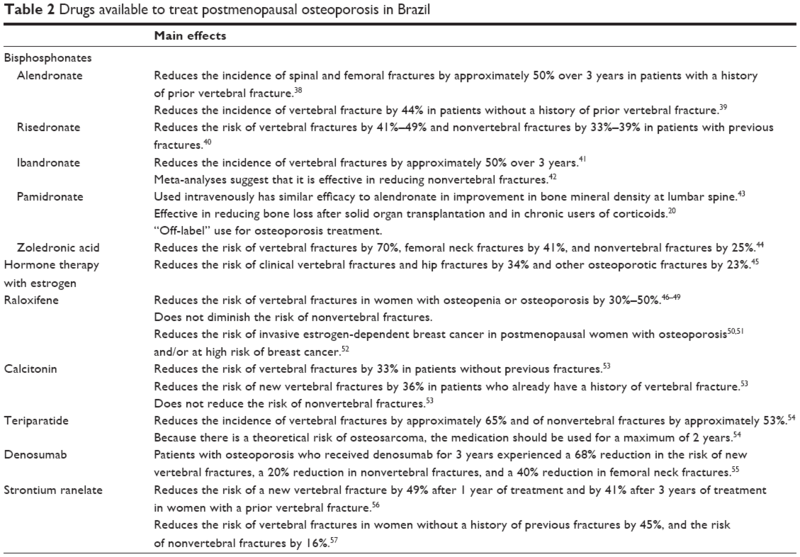 The burden of osteoporosis in Brazil: regional data from fractures in adult men and women – the Brazilian Osteoporosis Study (BRAZOS). Rev Bras Reumatol. 2010;50(2):113–127. Pinheiro MM, Reis Neto ET, Machado FS, et al. Risk factors for osteoporotic fractures and low bone density in pre and postmenopausal women. Rev Saude Publica. 2010;44(3):479–485. Buttros Dde A, Nahas-Neto J, Nahas EA, Cangussu LM, Barral AB, Kawakami MS. Fatores de risco para osteoporose em mulheres na pós-menopausa do sudeste brasileiro [Risk factors for osteoporosis in postmenopausal women from southeast Brazilian]. Rev Bras Ginecol Obstet. 2011;33(6):295–302. Portuguese. Baccaro LF, de Souza Santos Machado V, Costa-Paiva L, Sousa MH, Osis MJ, Pinto-Neto AM. Factors associated with osteoporosis in Brazilian women: a population-based household survey. Arch Osteoporos. 2013;8(1–2):138. Pinheiro MM, Schuch NJ, Genaro PS, Ciconelli RM, Ferraz MB, Martini LA. Nutrient intakes related to osteoporotic fractures in men and women – the Brazilian Osteoporosis Study (BRAZOS). Nutr J. 2009;(29);8:6. Haussler MR, Whitfield GK, Haussler CA, et al. The nuclear vitamin D receptor: biological and molecular regulatory properties revealed. J Bone Miner Res. 1998;13(3):325–349. Holick MF, Chen TC, Lu Z, Sauter E. Vitamin D and skin physiology: a D-lightful story. J Bone Miner Res. 2007;22(Suppl 2):V28–V33. Arantes HP, Kulak CA, Fernandes CE, et al. Correlation between 25-hydroxyvitamin D levels and latitude in Brazilian postmenopausal women: from the Arzoxifene Generations Trial. Osteoporos Int. 2013;24(10):2707–2712. Kanis JA, Melton LJ 3rd, Christiansen C, Johnston CC, Khaltaev N. The diagnosis of osteoporosis. J Bone Miner Res. 1994;9(8):1137–1141. Ministério da Saúde, Brasil. Protocolo Clínico e Diretrizes Terapêuticas: Osteoporose. Portaria SAS/MS n. 451 de 09 de junho de 2014, retificada em 18 de junho de 2014. Available from: http://portalsaude.saude.gov.br/images/pdf/2014/dezembro/15/Osteoporose.pdf. Accessed January 20, 2015. Nelson HD, Haney EM, Chou R, Dana T, Fu R, Bougatsos C. Screening for Osteoporosis: Systematic Review to Update the 2002 US Preventive Services Task Force Recommendation. Evidence Syntheses No 77. AHRQ Publication No 10-05145-EF-1. Rockville, MD: Agency for Healthcare Research and Quality; 2010. The North American Menopause Society. 25th Annual Meeting of The North American Menopause Society October 15-October 18, 2014, Washington, DC. USPSTF Osteoporosis Screening Strategy: Confirming its predictive ability may prove challenging? (Abstract S-13). Menopause 2014;21(12):1320–1369. Pinheiro MM, Reis Neto ET, Machado FS, Omura F, Szejnfeld J, Szejnfeld VL. Development and validation of a tool for identifying women with low bone mineral density and low-impact fractures: the São Paulo Osteoporosis Risk Index (SAPORI). Osteoporos Int. 2012;(23):1371–1379. Available from http://www2.unifesp.br/dmed/reumato/sapori. Accessed November 25, 2014. Ministério da Saúde, Brasil. Portaria n. 1101/GM em 12 de junho de 2002. Available from: http://dtr2001.saude.gov.br/sas/PORTARIAS/Port2002/Gm/GM-1101.htm. Accessed November 25, 2014. Instituto Brasileiro de Geografia e Estatística. Indicadores sociodemográficos e de saúde no Brasil 2009. Escassez e fartura: distribuição da oferta de equipamentos de diagnóstico por imagem no Brasil. Available from: http://www.ibge.gov.br/home/estatistica/populacao/indic_sociosaude/2009/com_esca.pdf. Accessed November 25, 2014. Hernandes ES, Lebrão ML, Duarte YA, Santos JL. Health insurance coverage of the elderly and socioepidemiological characteristics associated. Rev Saude Publica. 2012;46(6):1030–1038. Ross PD, Davis JW, Epstein RS, Wasnich RD. Pre-existing fractures and bone mass predict vertebral fracture incidence in women. Ann Intern Med. 1991;114(11):919–923. Associação Médica Brasileira e Conselho Federal de Medicina. Osteoporose: Diagnóstico. Projeto Diretrizes, 2011. Available from: http://www.projetodiretrizes.org.br/diretrizes10/osteoporose_diagnostico.pdf. Accessed January 20, 2015. Gillespie LD, Robertson MC, Gillespie WJ, et al. Interventions for preventing falls in older people living in the community. Cochrane Database Syst Rev. 2009;2:CD007146. Shea B, Wells GA, Cranney A, et al. Calcium supplementation on bone loss in postmenopausal women. Cochrane Database Syst Rev. 2004;1:CD004526. Bolland MJ, Avenell A, Baron JA, et al. Effect of calcium supplements on risk of myocardial infarction and cardiovascular events: meta-analysis. BMJ. 2010(29);341:c3691. Paik JM, Curhan GC, Sun Q, et al. Calcium supplement intake and risk of cardiovascular disease in women. Osteoporos Int. 2014;25(8):2047–2056. Maeda SS, Borba VZ, Camargo MB, et al. Recommendations of the Brazilian Society of Endocrinology and Metabology (SBEM) for the diagnosis and treatment of hypovitaminosis D. Arq Bras Endocrinol Metabol. 2014;58(5):411–33. Holick MF, Binkley NC, Bischoff-Ferrari HA, et al. Evaluation, treatment, and prevention of vitamin D deficiency: an Endocrine Society clinical practice guideline. J Clin Endocrinol Metab. 2011;96(7):1911–1930. Kanis JA, Johnell O, Oden A, Johansson H, McCloskey E. FRAX and the assessment of fracture probability in men and women from the UK. Osteoporos Int. 2008;(19):385–397. Ensrud KE, Lui LY, Taylor BC, et al; Study of Osteoporotic Fractures Research Group. A comparison of prediction models for fractures in older women: is more better? Arch Intern Med. 2009;169(22):2087–2094. Black DM, Cummings SR, Karpf DB, et al. Randomised trial of effect of alendronate on risk of fracture in women with existing vertebral fractures. Fracture Intervention Trial Research Group. Lancet. 1996;348(9041):1535–1541. Cummings SR, Black DM, Thompson DE, et al. Effect of alendronate on risk of fracture in women with low bone density but without vertebral fractures: results from the Fracture Intervention Trial. JAMA. 1998;280(24):2077–2082. Reginster J, Minne HW, Sorensen OH, et al. Randomized trial of the effects of risedronate on vertebral fractures in women with established postmenopausal osteoporosis. Vertebral Efficacy with Risedronate Therapy (VERT) Study Group. Osteoporos Int. 2000;11(1):83–91. Chesnut III CH, Skag A, Christiansen C, et al. Effects of oral ibandronate administered daily or intermittently on fracture risk in postmenopausal osteoporosis. J Bone Miner Res. 2004;19(8):1241–1249. Harris ST, Blumentals WA, Miller PD. Ibandronate and the risk of non-vertebral and clinical fractures in women with postmenopausal osteoporosis: results of a meta-analysis of phase III studies. Curr Med Res Opin. 2008;24(1):237–245. Heijckmann AC, Juttmann JR, Wolffenbuttel BH. Intravenous pamidronate compared with oral alendronate for the treatment of postmenopausal osteoporosis. Neth J Med. 2002;60(8):315–319. Black DM, Delmas PD, Eastell R, et al. Once-yearly zoledronic acid for treatment of postmenopausal osteoporosis. N Engl J Med. 2007;356(18):1809–1822. Rossouw JE, Anderson GL, Prentice RL, et al. 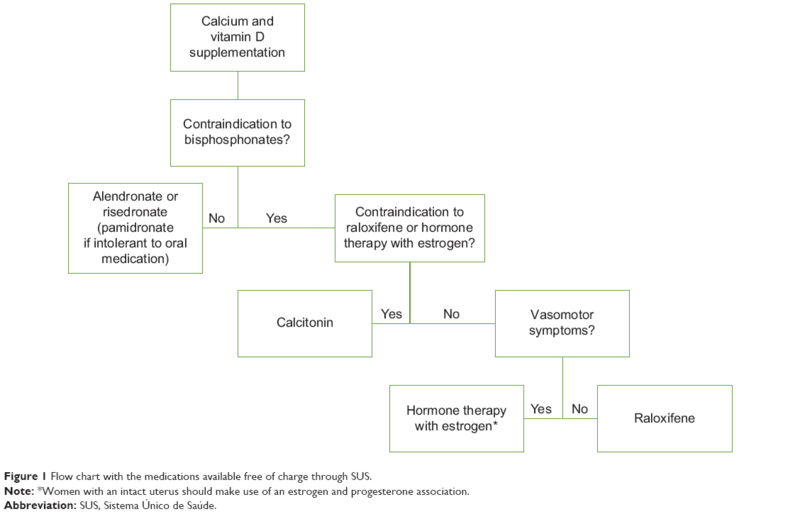 Risks and benefits of estrogen plus progestin in healthy postmenopausal women: principal results from the Women’s Health Initiative randomized controlled trial. JAMA. 2002;288(3):321–333. Ettinger B, Black DM, Mitlak BH, et al. Reduction of vertebral fracture risk in postmenopausal women with osteoporosis treated with raloxifene: results from a 3-year randomized clinical trial. Multiple Outcomes of Raloxifene Evaluation (MORE) Investigators. JAMA. 1999;282(7):637–645. Siris E, Adachi JD, Lu Y, et al. Effects of raloxifene on fracture severity in postmenopausal women with osteoporosis: results from the MORE study. Multiple Outcomes of Raloxifene Evaluation. Osteoporos Int. 2002;13(11):907–913. Ensrud KE, Stock JL, Barrett-Connor E, et al. Effects of raloxifene on fracture risk in postmenopausal women: the Raloxifene Use for the Heart Trial. J Bone Miner Res. 2008;23(1):112–120. Kanis JA, Johnell O, Black DM, et al. Effect of raloxifene on the risk of new vertebral fracture in postmenopausal women with osteopenia or osteoporosis: a reanalysis of the Multiple Outcomes of Raloxifene Evaluation trial. Bone. 2003;33(3):293–300. Martino S, Cauley JA, Barrett-Connor E, et al. Continuing outcomes relevant to Evista: breast cancer incidence in postmenopausal osteoporotic women in a randomized trial of raloxifene. J Natl Cancer Inst. 2004;96(23):1751–1761. Cummings SR, Eckert S, Krueger KA, et al. The effect of raloxifene on risk of breast cancer in postmenopausal women: results from the MORE randomized trial. Multiple Outcomes of Raloxifene Evaluation. JAMA. 1999;281(23):2189–2197. Vogel VG, Costantino JP, Wickerham DL, et al. Effects of tamoxifen vs raloxifene on the risk of developing invasive breast cancer and other disease outcomes: the NSABP Study of Tamoxifen and Raloxifene (STAR) P-2 trial. JAMA. 2006;295(23):2727–2741. Chesnut CH 3rd, Silverman S, Andriano K, et al. A randomized trial of nasal spray salmon calcitonin in postmenopausal women with established osteoporosis: the prevent recurrence of osteoporotic fractures study. PROOF Study Group. Am J Med. 2000;109(4):267–276. Neer RM, Arnaud CD, Zanchetta JR, et al. Effect of parathyroid hormone (1–34) on fractures and bone mineral density in postmenopausal women with osteoporosis. N Engl J Med. 2001;344(19):1434–1441. Meunier PJ, Roux C, Seeman E, et al. The effects of strontium ranelate on the risk of vertebral fracture in women with postmenopausal osteoporosis. N Engl J Med. 2004;350(5):459–468. Reginster JY, Seeman E, De Vernejoul MC, et al. Strontium ranelate reduces the risk of nonvertebral fractures in postmenopausal women with osteoporosis: Treatment of Peripheral Osteoporosis (TROPOS) study. J Clin Endocrinol Metab. 2005;90(5):2816–2822. Bahia L, Costa A, Fernandes C, Luiz RR, Cavalcanti MdLT. Segmentation of the demand of the plans and private insurances of health: an analysis of the information of PNAD/98. Ciênc Saúde Coletiva. 2002;7(4):671–686. Brandão CM, Ferré F, Machado GP, et al. Public spending on drugs for the treatment of osteoporosis in post-menopause. Rev Saude Publica. 2013;47(2):390–402. Moraes LF, Silva EN, Silva DA, Paula AP. Expenditures on the treatment of osteoporosis in the elderly in Brazil (2008–2010): analysis of associated factors. Rev Bras Epidemiol. 2014;17(3):719–734. de Castro Gomes DA, Valadares AL, Pinto-Neto AM, Morais SS, Costa-Paiva L. Ability to follow drug treatment with calcium and vitamin D in postmenopausal women with reduced bone mass. Menopause. 2012;19(9):989–994. Gomes DC, Costa-Paiva L, Farhat FC, Pedro AO, Pinto-Neto AM. Ability to follow anti-reabsorptive drug treatment in postmenopausal women with reduced bone mass. Menopause. 2011;18(5):531–536. Abrahamsen B. Adverse effects of bisphosphonates. Calcif Tissue Int. 2010;86(6):421–435. Watts NB, Diab DL. Long-term use of bisphosphonates in osteoporosis. J Clin Endocrinol Metab. 2010;95(4):1555–1565.